Full Untapt HR Software Review - All You Need to Know About Untapt | Skyose - All-In-One Platform For Guides, Tips and many more. Small, medium-size and large enterprises can enjoy talent management with software like Untapt. Untapt debuted in 2013, and it has its headquarters in New York. This software matches businesses and candidates with its AI algorithm. Untapt provides services for corporations, hiring managers, and job candidates alike. In this article, we will do a deep-dive review into this hotel management software. We will uncover its features, benefits, and weaknesses. What is The Untapt Human Resource Software? Untapt is cloud-based software that provides talent management and job search engine solutions to hiring managers, businesses, and applicants alike. 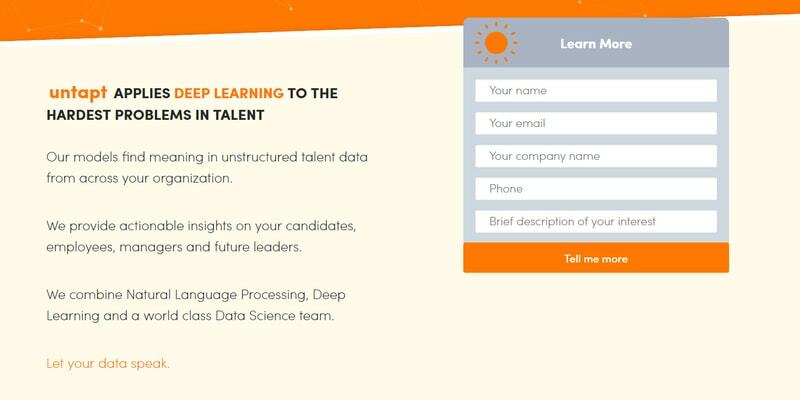 This software makes use of Deep Learning and Artificial Intelligence to solve hard and common talent management issues. Untapt gives recruitment agencies, and Human Resource managers access to top-notch applicants with the use of its AI algorithm. This algorithm helps in providing accurate applicant matching when users search for them. This software also has an email engine that supports multiple stage campaigns and email automation. This feature allows you to get in touch with candidates easily. Uptapt has three different platforms that work seamlessly with each other to provide you with all the functionalities and tools you need to search for, contact, and hire the applicants you want. 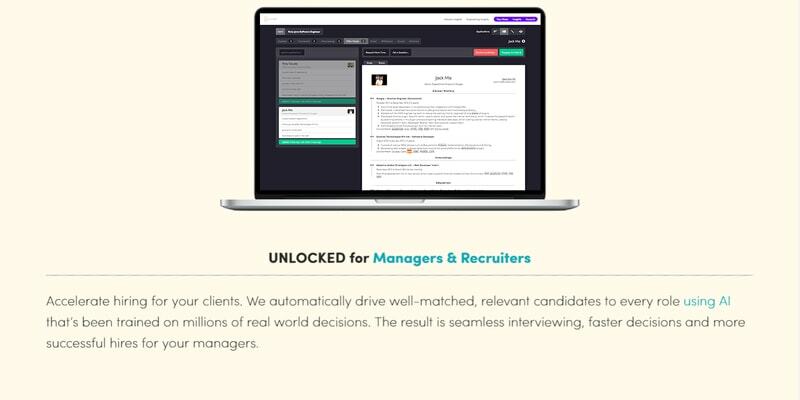 Untapt Unlocked is a module which provides essential tools for recruitment to recruiters and hiring managers. This platform includes AI features which help in matching candidates to roles. 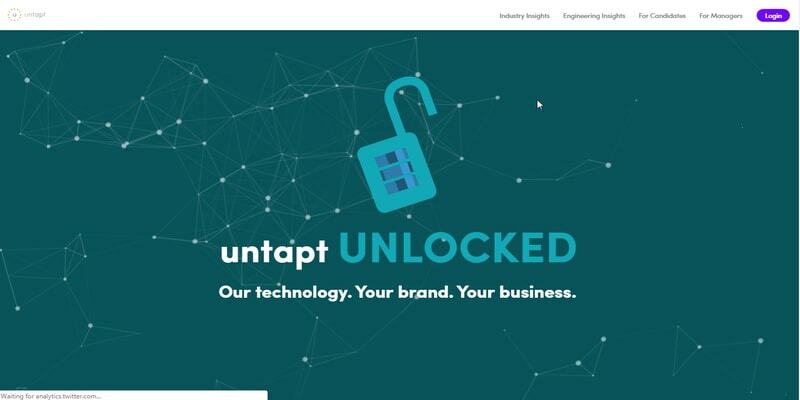 Untapt also offers a Untapt Unlocked module for recruitment agencies managing the recruitment process for other companies. The Untapt Intelligence platform, on the other hand, provides features and tools to help you analyze your existing talents. Before you get awed by all this, there are other parts of this article that you must read. These sections are vital to give you a full picture of what Untapt represents. Untapt offers job-seekers a personalized experience from the sign-up stage to final hire. As a candidate on this software, Untapt confidentially keeps your resume and will not share it without your knowledge. Untapt provides a wonderfully curated job board for candidates. On this job boards, there are jobs from different types and sizes of companies. 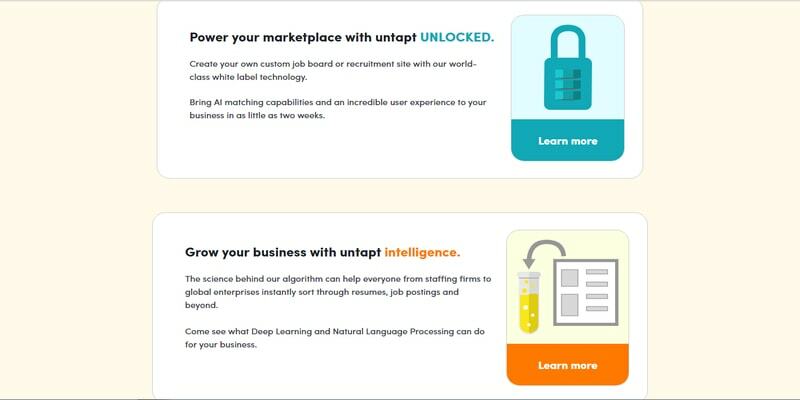 Untapt makes use of AI to find the right jobs for you. Untapt also helps candidates build their resumes straight from their LinkedIn profiles or from resumes uploaded. This software advises candidates about the length of their resumes and the skills that are on it to ensure that the matching process is not complicated. This software will also make you understand the companies looking for applicants properly by providing you with all the details about the company from its mission to the type of technology used. Video content from the real team looking for applicants will also be available on this platform. If you are interested in a company, all you have to do is click on the ‘Interested’ button. As a candidate, you can see jobs, but jobs can’t see you. Untapt uses AI to drive relevant and well-matched candidates to every role automatically. This software helps you to accelerate the hiring process. There is a miniature ATS within the system of this software. As a hiring manager or recruiter, you can run as many job applications on the platforms. You can drive this hiring platform directly from your email. This platform provides small thumbnails for each of the applicants in your pipeline. You can see the status (applied, connected, interviewing, and offer mode) of your applicants directly on your pipeline. To communicate with your applicants, all you have to do is click on the thumbnails. This software allows you to work in coordination with other hiring manager or your HR team. Untapt also creates descriptions about your company, and it also allows you to upload video content. This software features job boards, thumbnails, cand others. Let’s take a look at the features associated with this software, shall we? This platform provides a structure for your business to ensure that your business succeeds. 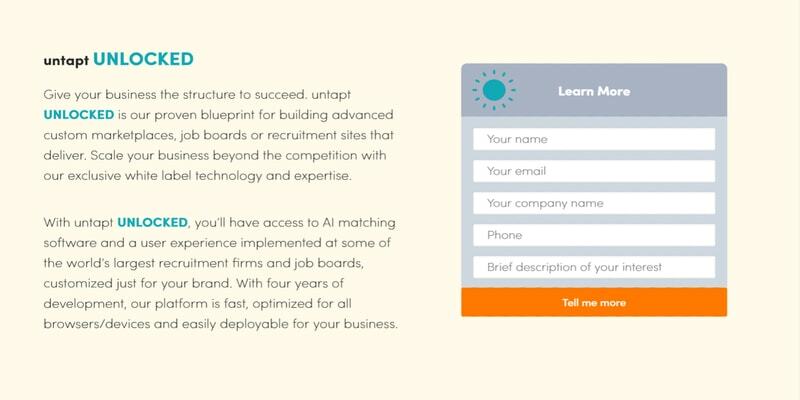 Untapt Unlocked helps your business with blueprints to build job boards, recruitment sites, and customized marketplaces that work. With this platform, you can successfully scale your business with expertise and Untapt’s exclusive white label technology. This platform gives you access to a customizable Artificial Intelligent matching software and implemented user experience. Untapt Unlocked supports all devices and browsers, and you can quickly deploy it for your business. These job boards are available for applicants users of this software. Here, different companies and hiring managers have placed their ad for a job description. As an applicant, you can see all the company information and team members. This information will help you further understand the company you are applying. This software provides actionable insights on your employees, candidates, managers, and team members. Untapt also allows you to advance the careers and productivity of your employees by connecting them with internal opportunities. The actionable insights help you assess your employee’s performances, career data, and employee satisfaction to develop an understanding of what is working in your company and what isn’t. These insights also allow you as a hiring manager to identify future team leads and assess career paths of your employees. 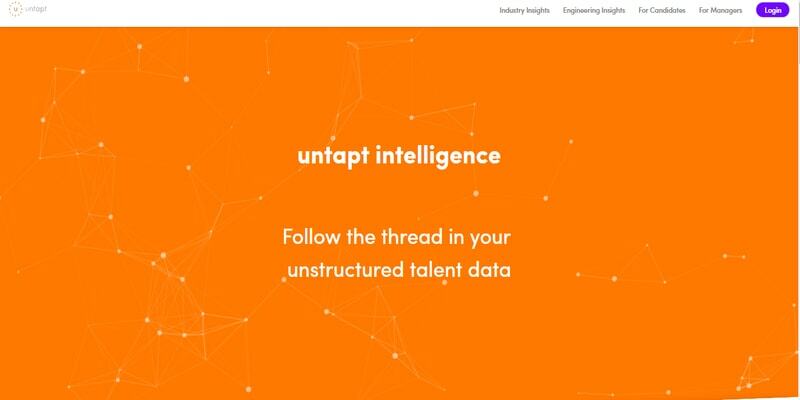 Untapt applies deep learning, natural language processing, data science and artificial intelligence to solve talent management hardest problems. 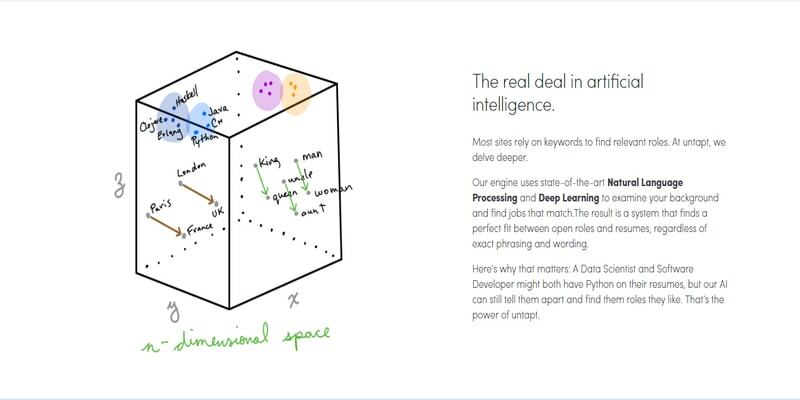 This software makes use of specially designed semantic and deep learning models to understand talent. Untapt helps manage the growth of employees, and it helps in accurately placing them in companies. 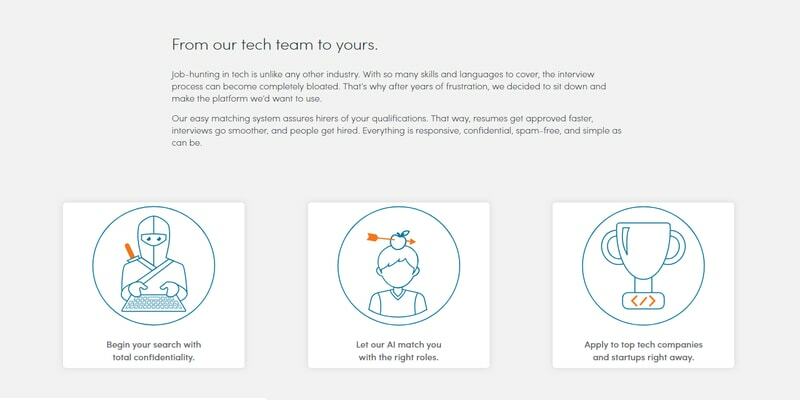 This software’s AI algorithm reviews resumes with the same accuracy as a human recruiter. This feature allows the software to power the resume scanning so no buzzwords can fool the system. This software sorts out the resume using this natural language processing and the engine makes use of feedback to differentiate between matches and non-matches. This software has a complete understanding of resumes, and it uses its technology to calculate the fit between job descriptions and resumes. Untapt automates resume matching with the skill of a specialized recruiter. This talent pipeline gives you visuals into the status of candidates that have applied to your jobs. Untapt routes candidates to the right positions using this platform. Hiring managers can easily know their hiring probability as well as the skills they have, and the skills needed in their company directly from this talent pipeline. Untapt’s AI technology assures hirers of candidate qualification, and this increases the rate of matching candidates to companies. This software is confidential, responsive, simple, and free of spam. With this software, hiring candidates are faster, and due to this, the approval, and interview processes go easier. This software helps you build your resume straight from your Linkedin profile or resume uploaded. Untapt advises candidates on the length of their resume and the skills to add on their resume. 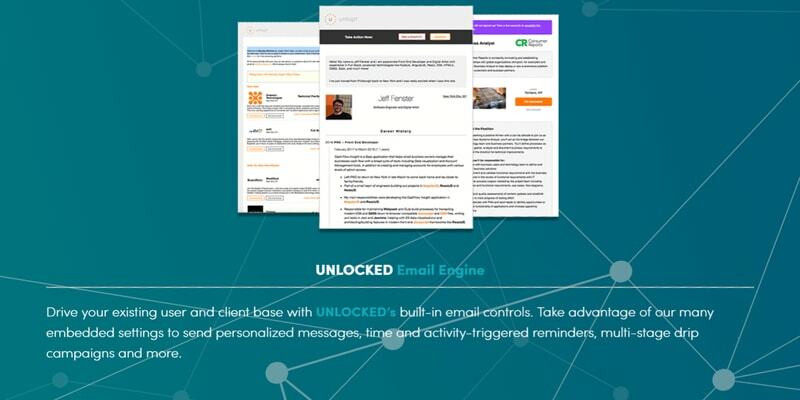 Untapt has inbuilt email controls which allow you to drive your existing client base through your email. This software possesses different embedded settings which help in sending personal messages, reminders, campaigns, and more. The thumbnail description shows you description and status of all your applicants. As a hiring manager, you can click on the thumbnails to get more information on the candidates. You can also send your candidates a message by clicking on this thumbnails. You can check the candidates that applied, those that you have connected with, those you are interviewing, and those you are about to make an offer on this thumbnail description. You can easily search for jobs on this platform. With this search engine, you can begin your search with complete confidentiality. This search engine possesses a secure matching system which simplifies the application process and ensures that applicants offering for positions are compatible. Businesses and Organizations of all types and sizes are attracted to the Untapt HR software because of its benefits. Highlighted below are the key attraction points of this software. Let’s take a look. This human resource software is straightforward to use as it possesses an intuitive interface that makes it easier for both candidates and managers to navigate. This software optimizes the screening process with the use of its AI algorithm to match the right candidates to the right companies. Untapt review the resumes of candidates with the accuracy of real recruiting managers. The user interfaces for both candidates and hiring managers possess intuitive features which make the process easier. You can access the tools and functionalities without any obstruction. The job boards and dashboard make it easy for users to have a fantastic user experience. Beginners will have no problem navigating this software. This software keeps all data shared such as resume and personal information confidentially. Untapt will not share the data of any of their users without their permission. Every information shared on this software is safe and secure. This software provides very responsive customer support for its users. Their support agents are readily available to resolve any complaints or issues you might have. There are also resources and training materials available on this software to help users troubleshoot their problems without needing to contact customer support. Even the best software has setbacks, and unfortunately, Untapt is not exempt. Let’s take a look at the drawbacks associated with this Human resource software, shall we? To get the price model for the different platforms on this software, you have to contact the software company. This price ambiguity is a problem for most users as they have to wait to get a price quote rather than its availability on their website. This software provides three modules which work both collectively and individually. The pricing plans of this platforms are on a quote basis so you’ll have to contact the company for a price quote. This platform features the creation of job boards, custom marketplaces, and recruitment sites. You have to contact the software vendor for a price quote. This module helps users analyze their employees and talent. 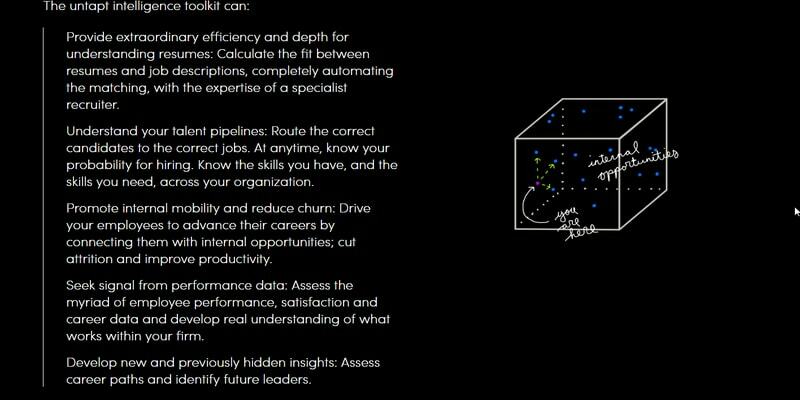 With this platform, you can run models to understand your organization’s unstructured talent data. This module features an AI algorithm that helps you match relevant applicants to job openings. Here are the technical details associated with this Human Resource software. Untapt provides stellar customer support for their clients. You can reach their support agents through a variety of ways such as email and phone. The support agents are always available during business hours to solve any issues you might have hastily. Their self-help service support provides webinars, resources, and training to help users further understand the software. Untapt is an amazing Human Resource management software solution. It provides different platforms and tools for candidates and hiring managers alike. This software makes use of Natural Deep Learning and Artificial Intelligence to match candidates to the right companies accurately. Although Untapt HR software has its weaknesses, it remains a very robust software. So, is Untapt the best Human Resource Management Software in the market? We don’t know, why don’t you tell us?